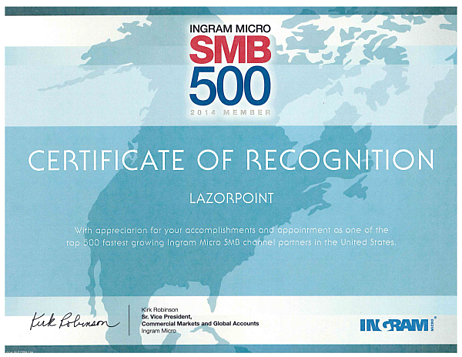 Lazorpoint has joined the ranks of the top 500 fastest-growing Ingram Micro SMB channel partners in the United States. The Ingram Micro SMB 500 is a compliation of their most successful reseller customers, all of whom had to meet a stringent set of performance criteria. The SMB 500 serves as a benchmark for the IT industry at large. We are very excited to be a part of this prestigious group, and we thank our clients for helping us earn this award by winning their trust and becoming their go-to IT consulting and managed services provider.